We know that we should recycle at home, but often we forget about the environmental impact our offices can have. We hope to help you achieve your sustainability goals by arming you with tools to successfully implement your office recycling initiative. We know that we should recycle at home, but often we forget about the environmental impact our workplaces can have. Think about it: 100 employees, 100 lunches worth of waste. With this in mind, we believe that better workplace habits really can create a better world. Thanks to our modern philosophy of Open Plan Recycling we've proven that by giving employees a simple recycling solution that stands out, a visible difference can be made. We hope to help you achieve your sustainability goals by arming you with tools to successfully implement an office recycling initiative. Say goodbye to linear thinking. A linear economy can be defined as when products are made, used, and then disposed of, with their materials lost to landfill. In a recycling economy, the materials from a product or its packaging can be utilised by other suppliers into other products. A circular economy takes our Principles of Wasting Less even further by creating a process where materials can be recycled and reused over and over again by the manufacturer, who take responsibility for the lifecycle and end-of-life of what they produce. Companies can effectively take their old products and turn them into new ones. This idea of a circular economy is something that is at the heart of our vision and what we’re trying to achieve as we work towards a zero waste model. What are the benefits of a circular economy? A circular economy means retaining the value of resources by extending their lifespans, and therefore working to ultimately eradicate waste as we know it. The benefits include a reduction in greenhouse gases and increased production of jobs. 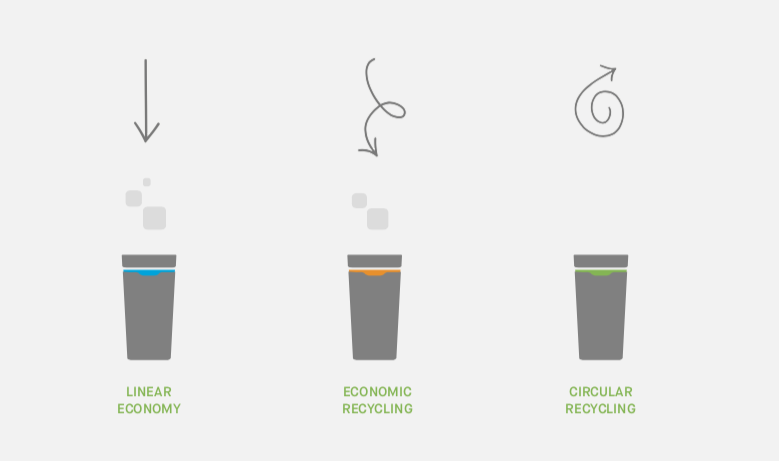 How can we implement the Hierarchy of Waste and the idea of a circular economy into our everyday lives? The simplest and most efficient way is through introducing a successful recycling initiative into our workplaces. Huge savings can occur when switching from individual desk bins to centralised recycling bins. Drastically reduce cleaners fees by lessening the time spent per bin, as well as the amount of liners you’re using. Starting a recycling initiative improves your corporate social responsibility and your company’s image. As more and more consumers are realising the necessity of environmental responsibility, they are shifting their allegiances to more conscious brands that encompass these moral values. By incorporating recycling into your workplace, you are spearheading a campaign to change your colleagues into changemakers. Reinforcing positive behaviours will hopefully then be translated into their home lives, too. Recycling bins can create a water cooler effect, starting a conversation in your workplace that helps inspire collective effort when it comes to sustainability. 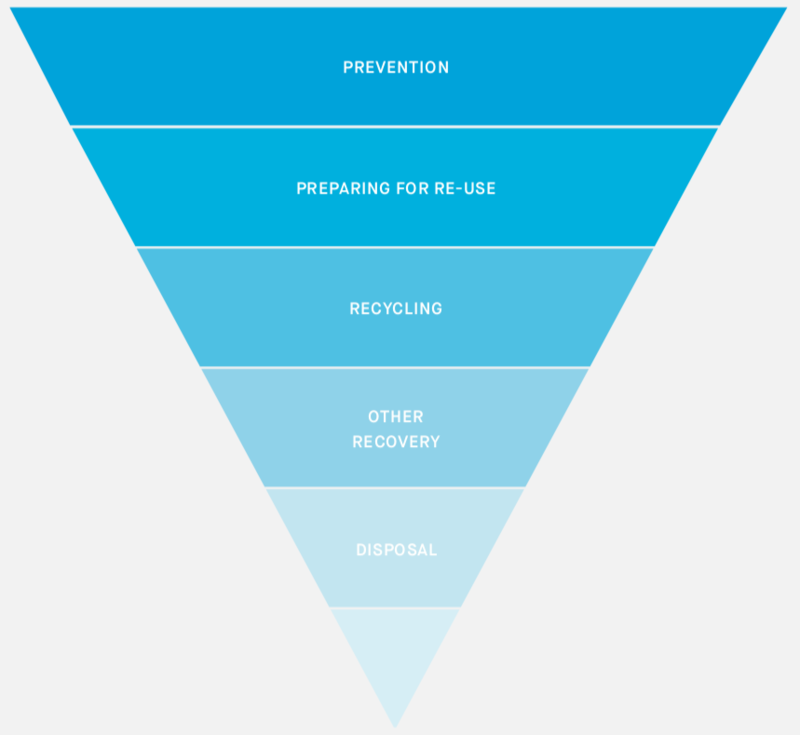 Recycling reduces the harmful chemicals released from waste in landfill sites, and the need for extracting, refining and processing raw materials.